Wei Chen (陈薇) is a lead researcher in Machine Learning Group, Microsoft Research Asia. 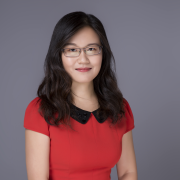 She is leading basic theory and methods in machine learning research team with the following interests: theoretical understanding and algorithm improvements of deep learning, reinforcement learning, distributed machine learning, machine learning for games, and learning to rank. Before she joined Microsoft in July 2011, she obtained her Ph. D. in probability and mathematical statistics from Academy of Mathematics and System Science under the supervision of Prof. Zhi-Ming Ma, Chinese Academy of Sciences. If you have the same research interests with us (especially deep learning and reinforcement leaning), please send your resume to wche@microsoft.com. Li He, Shuxin Zheng, Wei Chen, Zhi-Ming Ma, and Tie-Yan Liu, OptQuant: Distributed Training of Neural Networks with Optimized Quantization Mechanism, NeuroComputing, 2019. Shuxin Zheng, Qi Meng, Huishuai Zhang, Wei Chen, and Tie-Yan Liu, Capacity Control of ReLU Neural Networks by Basis-path Norm, In Proceedings of the 33rd International Association for the Advancement of Artificial Intelligence Conference (AAAI), 2019. Qi Meng, Wei Chen, Zhi-Ming Ma, and Tie-Yan Liu, Convergence Analysis of Distributed Stochastic Gradient Descent with Shuffling, NeuroComputing, 2019. Huishuai Zhang, Wei Chen, and Tie-Yan Liu, On the Local Hessian in Back-propagation, In Advances in Neural Information Processing Systems 32 (NeurIPS), 2018. Da Yu, Huishuai Zhang, and Wei Chen, Improving Gradient Perturbation for Differentially Private Optimization, NeurIPS Workshop on Privacy Preserving Machine Learning, 2018. Zhuohan Li, Di He, Fei Tian, Wei Chen, Tao Qin, Liwei Wang, and Tie-Yan Liu, Towards Binary-Valued Gates for Robust LSTM Training, In Proceeding of the 35th International Conference on Machine Learning （ICML), 2018. Li He, Qi Meng, Wei Chen, Zhi-Ming Ma, and Tie-Yan Liu, Differential Equations for Modeling Asynchronous Algorithms, In Proceedings of the 28th International Joint Conference on Artificial Intelligence (IJCAI), 2018. Guolin Ke, Qi Meng, Taifeng Wang, Wei Chen, Weidong Ma, Tie-Yan Liu, LightGBM: A Highly Efficient Gradient Boosting Decision Tree, In Advances in Neural Information Processing Systems 31 (NeurIPS), 2017. Shizhao Sun, Wei Chen, Jiang Bian, Xiaoguang Liu and Tie-Yan Liu, Ensemble-Compression: A New Method for Parallel Training of Deep Neural Networks, European Conference on Machine Learning (ECML), 2017. Quanming Yao, James Kwok, Fei Gao, Wei Chen, and Tie-Yan Liu, Efficient Inexact Proximal Gradient Algorithm for Nonconvex Problems, In Proceedings of the 27th International Joint Conference on Artificial Intelligence (IJCAI), 2017. Qi Meng, Wei Chen, Jingcheng Yu, Taifeng Wang, Zhi-Ming Ma and Tie-Yan Liu, Asynchronous Stochastic Proximal Optimization Algorithms with Variance Reduction, Proceedings of the 31st International Association for the Advancement of Artificial Intelligence Conference (AAAI), 2017. Qi Meng, Yue Wang, Wei Chen, Taifeng Wang, Zhi-Ming Ma and Tie-Yan Liu, Generalization Error Bounds for Optimization Algorithms via Stability, Proceedings of the 31st International Association for the Advancement of Artificial Intelligence Conference (AAAI), 2017. Qi Meng, Guolin Ke, Taifeng Wang, Wei Chen, Qiwei Ye, Zhi-Ming Ma, and Tie-Yan Liu, A Communication-efficient Parallel Algorithms for Decision Tree, Advances in Neural Information Processing Systems 30 (NeurIPS), 2016. Qi Meng, Wei Chen, Jingcheng Yu, Taifeng Wang, Zhi-Ming Ma, and Tie-Yan Liu, Asynchronous Accelerated Stochastic Gradient Descent, In Proceedings of the 26th International Joint Conference on Artificial Intelligence (IJCAI), 2016. Wei Chen, Tie-Yan Liu, and Xinxin Yang, Reinforcement Learning Behaviors in Sponsored Search, Applied Stochastic Models in Business and Industry (ASMB),2016. Shizhao Sun, Wei Chen, Liwei Wang, Xiaoguang Liu, and Tie-Yan Liu, On the Depth of Deep Neural Networks: A Theoretical View, In Proceedings of the 30th International Association for the Advancement of Artificial Intelligence Conference (AAAI), 2016. Tie-Yan Liu, Wei Chen, and Tao Qin, Mechanism Learning with Mechanism Induced Data, Senior Member Track, In Proceedings of the 29th International Association for the Advancement of Artificial Intelligence Conference (AAAI), 2015. Haifang Li, Tian Fei, Wei Chen, Tao Qin, Zhiming Ma, and Tie-Yan Liu, Generalization Analysis for Game-Theoretic Machine Learning, Proceedings of the 29th International Association for the Advancement of Artificial Intelligence Conference (AAAI), 2015. Tao Qin, Wei Chen, and Tie-Yan Liu, Sponsored Search Auctions: Recent Advances and Future Directions, ACM Transactions on Intelligent Systems and Technology (TIST),5 (4), 2014. Wei Chen, Di He, Tie-Yan Liu, Tao Qin, Yixin Tao, and Liwei Wang, Generalized Second Price Auction with Probabilistic Broad Match, In Proceedings of the 15th ACM Conference on Economics and Computation (EC), Pages 39-56, 2014. Fei Tian, Haifang Li, Wei Chen, Tao Qin and Tie-Yan Liu, Agent Behavior Prediction and Its Generalization Analysis, In Proceedings of the 28th International Association for the Advancement of Artificial Intelligence Conference (AAAI), Pages 1300-1306, 2014. Jun Feng, Jiang Bian, Taifeng Wang, Wei Chen, Xiaoyan Zhu and Tie-Yan Liu, Sampling Dilemma: Towards Effective Data Sampling for Click Prediction in Sponsored Search, In Proceedings of 7th ACM Conference on Web Search and Data Mining (WSDM), Pages 130-112, 2014. Di He, Wei Chen, Liwei Wang, and Tie-Yan Liu, Online Learning for Auction Mechanism in Bandit Setting, Decision Support Systems (DSS), Vol 56, Pages 379-386, 2013. Di He, Wei Chen, Liwei Wang, Tie-Yan Liu, A Game-theoretic Machine Learning Approach for Revenue Maximization in Sponsored Search, In Proceedings of the 23rd International Joint Conference on Artificial Intelligence (IJCAI), Pages 206-212, 2013. Lei Yao, Wei Chen, Tie-Yan Liu. Convergence Analysis for Weighted Joint Strategy Fictitious Play in Generalized Second Price Auction, Proceedings of the 10th Conference on Web and Internet Economics (WINE), Pages 489-495, 2012. Wei Chen, Tie-Yan Liu, and Zhiming Ma, Two-Layer Generalization Analysis for Ranking Using Rademacher Average, Advances in Neural Information Processing Systems 23 (NeurIPS), Pages 370-378, 2010. Wei Chen, Tie-Yan Liu, Yanyan Lan, and Zhiming Ma, Ranking Measures and Loss functions in Learning to Rank, Advances in Neural Information Processing Systems 22 (NeurIPS), Pages 315-323, 2009. PC member: AAMAS 2015, AAAI 2017，2016，2015, IJCAI 2017，2016，2015, CIKM 2015, ACML 2015.